Spoiler: The damage can go on for hours. Whether it’s a weekend at the beach or just your usual walk to the office, you go home at the end of the day with changes on your skin. Maybe it’s more obvious like a sun-kissed glow, or maybe there are no glaringly visible traces. The bottom line is, the sun affects your skin in more ways than one, and changes can start in even less than five minutes. Here’s the low-down on what the sun can do to your skin. 1. It helps the skin create Vitamin D.
The body doesn't readily absorb Vitamin D from the sun. In fact, it’s exposure to the sun that helps your skin produce Vitamin D, which is needed for strong bones and a stronger immune system. The question is, how much sun do we need to get a sufficient amount of Vitamin D? There’s actually a formula for it, which considers factors such as your skin type, the latitude, and time of the day. Sounds complicated? You can also turn to food like salmon, milk, and tuna as well as supplements for some Vitamin D.
2. It causes DNA damage. 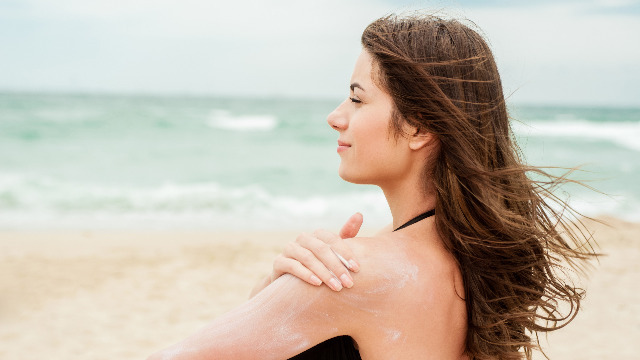 It only takes minutes of sun exposure to damage your skin. It doesn’t end there either; DNA damage can progress for hours, long after you’ve arrived at the office or settled back into your hotel room. Once UV rays breach the body’s defense (in the form of melanin, the pigment responsible for your tan), that’s when DNA damage occurs. Your best bet is to shield yourself with SPF before the damage happens. Vaseline Healthy White SPF 24 Lotion provides ample protection for your skin and comes with micro-droplets of Vaseline Petroleum jelly, perfect for locking in moisture and soothing damaged skin. 3. It ages your skin. Did you know that sun exposure is 80% responsible for wrinkles? Add diminished skin elasticity and pigmentation to the mix too. The real kicker is that sun exposure is cumulative, meaning every second of exposure adds up to damage. Stop your skin from rapid aging by slapping on some sunscreen. Because UV rays can sneak into your skin even on cloudy days, don’t limit sun protection to just sunny days, either.